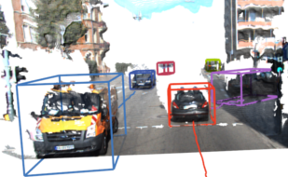 Tracking in urban street scenes plays a central role in autonomous systems such as self-driving cars. Most of the current vision-based tracking methods perform tracking in the image domain. Other approaches, e.g. based on LIDAR and radar, track purely in 3D. While some vision-based tracking methods invoke 3D information in parts of their pipeline, and some 3D-based methods utilize image-based information in components of their approach, we propose to use image- and world-space information jointly throughout our method. We present our tracking pipeline as a 3D extension of image-based tracking. From enhancing the detections with 3D measurements to the reported positions of every tracked object, we use world- space 3D information at every stage of processing. We accomplish this by our novel coupled 2D-3D Kalman filter, combined with a conceptually clean and extendable hypothesize-and-select framework. Our approach matches the current state-of-the-art on the official KITTI benchmark, which performs evaluation in the 2D image domain only. Further experiments show significant improvements in 3D localization precision by enabling our coupled 2D-3D tracking.